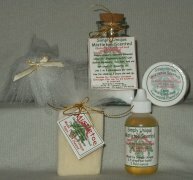 High quality, All Natural Skin Care Mistletoe Aromatherapy Bath Kit Only $25.00! Essential oils of Geranium, Rosemary, Clove, Ylang Ylang & Eucalyptus used for scenting. This is a very nice blend with a spicy accent. One of the World's most favored Scents!